Insulin resistance is a hallmark of type 2 diabetes mellitus and is associated with a metabolic and cardiovascular cluster of disorders (dyslipidaemia, hypertension, obesity [especially visceral], glucose intolerance, endothelial dysfunction), each of which is an independent risk factor for cardiovascular disease (CVD). Multiple prospective studies have documented an association between insulin resistance and accelerated CVD in patients with type 2 diabetes, as well as in non-diabetic individuals. The molecular causes of insulin resistance, i.e. impaired insulin signalling through the phosphoinositol-3 kinase pathway with intact signalling through the mitogen-activated protein kinase pathway, are responsible for the impairment in insulin-stimulated glucose metabolism and contribute to the accelerated rate of CVD in type 2 diabetes patients. The current epidemic of diabetes is being driven by the obesity epidemic, which represents a state of tissue fat overload. Accumulation of toxic lipid metabolites (fatty acyl CoA, diacylglycerol, ceramide) in muscle, liver, adipocytes, beta cells and arterial tissues contributes to insulin resistance, beta cell dysfunction and accelerated atherosclerosis, respectively, in type 2 diabetes. Treatment with thiazolidinediones mobilises fat out of tissues, leading to enhanced insulin sensitivity, improved beta cell function and decreased atherogenesis. Insulin resistance and lipotoxicity represent the missing links (beyond the classical cardiovascular risk factors) that help explain the accelerated rate of CVD in type 2 diabetic patients. 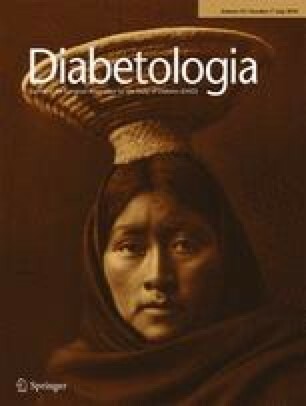 Type 2 diabetes mellitus is a complex metabolic disorder complicated by microvascular and macrovascular disease . Hyperglycaemia is the major risk factor for microvascular complications [2, 3] and reduction in HbA1c decreases the incidence of retinopathy, nephropathy and neuropathy [2, 3]. For every 1% decrement in HbA1c, the incidence of microvascular complications is reduced by ∼25% to 35%. Although microvascular complications are a major cause of morbidity, macrovascular complications represent the primary cause of mortality with heart attacks and stroke accounting for around 80% of all deaths . In type 2 diabetic patients without prior history of myocardial infarction, the 7-year incidence of myocardial infarction is equal to or greater than the 7-year incidence of heart attack in non-diabetic individuals with prior myocardial infarction . In diabetic patients with a previous heart attack, the 7-year incidence of subsequent myocardial infarction is more than double (45%) that of non-diabetic individuals . Similarly, the recurrence rate of major atherosclerotic complications in type 2 diabetic patients with a prior cardiovascular event is very high, around 6% per year . These results document that diabetes is a cardiovascular equivalent. Given the above observations and the negative results of the ACCORD , ADVANCE  and VADT  studies, in which intensified glycaemic control failed to reduce macrovascular complications, it is reasonable to ask what role hyperglycaemia plays in the development of cardiovascular disease (CVD). Epidemiological analysis of the UKPDS  demonstrated that rising HbA1c was associated with increased risk of myocardial infarction and stroke. However, the increased hazard ratio was modest and reduction in HbA1c following insulin or sulfonylurea therapy did not significantly decrease myocardial infarctions or strokes , although long-term follow up did demonstrate a significant reduction in atherosclerotic cardiovascular events . These results suggest a ‘memory’ effect of improved glycaemic control, reminiscent of the Diabetes Control and Complications Trial in type 1 diabetic patients . The negative results of the ACCORD, ADVANCE and VADT [7, 8, 9] studies have also led to questioning of the notion that improved glycaemic control prevents macrovascular complications in type 2 diabetic patients, especially in those with long-standing diabetes. What, for example, could explain the failure to observe a reduction in macrovascular events in these studies (see textbox: Insulin and atherosclerosis)? First, the underlying hypothesis is not based on sound pathophysiological evidence. Hyperglycaemia is a weak risk factor for CVD compared with other well established risk factors, e.g. dyslipidaemia and hypertension; moreover, most patients in the above studies were being treated with lipid-lowering medications, antihypertensive drugs and anti-inflammatory agents [7, 8, 9]. Second, participants had long-standing diabetes with a prior cardiovascular event or multiple risk factors for CVD. Third, insulin may be the wrong drug for prevention of CVD. Insulin is associated with weight gain [13, 14] and weight gain (obesity) is a major risk factor for CVD [15, 16]. Moreover, even small increments in plasma insulin cause severe insulin resistance [17, 18], which is also a risk factor for CVD. Fourth, the study population, although large in the ACCORD and ADVANCE studies, was inadequate, given the low annual incidence of cardiovascular complications (∼2% per year), to demonstrate a beneficial effect of improved glycaemic control. Many in vivo and in vitro studies have demonstrated that insulin, especially at high doses, can promote atherogenesis [19, 20, 21] (see textbox: Insulin and atherosclerosis). Insulin promotes de novo lipogenesis and augments hepatic VLDL synthesis [22, 23] via its stimulation of sterol regulatory-element-binding protein-1c and its inhibition of acetyl-CoA carboxylase . In cultured arterial smooth muscle cells, insulin augmented LDL-cholesterol transport . Insulin is a potent growth factor, augments collagen synthesis [26, 27], stimulates arterial smooth muscle cell proliferation [28, 29] and turns on multiple genes involved in inflammation . In vivo studies in dogs , rabbits  and chickens  provide further evidence that insulin promotes atherogenesis. Non-diabetic chickens fed a high-cholesterol diet develop severe atherosclerosis, which regresses when switched to low-cholesterol diet . Insulin administration when the low-cholesterol diet was instituted prevented regression of coronary atherosclerosis. Alloxan-induced diabetic rabbits fed a high-cholesterol diet developed marked hypercholesterolaemia, but their aorta remained free of atherosclerotic plaque . If rabbits are treated with insulin, severe atherosclerosis develops. Dogs receiving a low-dose insulin infusion into a hindlimb artery (to cause local, physiological hyperinsulinaemia) developed severe femoral atherosclerosis, whereas all other arteries remained free of atherosclerotic plaque . Rats chronically (7–10 days) infused with insulin while maintaining euglycaemia became markedly resistant to the stimulation of glucose uptake and suppression of plasma NEFA by insulin , and became hypertensive . Two other points about hyperinsulinaemia are noteworthy. In humans with normal glucose tolerance, insulin infusion to raise fasting plasma insulin from 57 to 104 pmol/l for 3 days produced severe insulin resistance [17, 18], a risk factor for CVD (see subsequent discussion). Finally, insulin therapy is invariably associated with weight gain [13, 14]. Most studies designed to reduce HbA1c <7.0% have required large insulin doses, failed to achieve the targeted HbA1c goal and resulted in weight gain [13, 14]. The study of Henry et al. is especially noteworthy. HbA1c was reduced from 7.7% to 5.1%, but this was associated with weight gain of 8.6 kg. This is of major concern since the current diabetes epidemic is being driven by obesity, a major risk factor for CVD [15, 16]. Weight gain promotes atherogenesis via multiple mechanisms including dyslipidaemia and hypertension. Fat deposition in the arterial wall promotes inflammation, which directly accelerates atherogenesis [34, 35, 36, 37]. Interestingly, 27.8% of individuals in the intensive treatment arm of the ACCORD study gained >10 kg . Much evidence indicates that insulin resistance per se and associated components of the insulin resistance (metabolic) syndrome (see textbox: Syndrome of insulin resistance) [38, 39, 40] contribute to development of CVD. Studies from our laboratory (Fig. 1) [1, 9, 41, 42, 43, 44] and others [45, 46] have demonstrated that lean type 2 diabetic and obese normal glucose tolerant participants are resistant to insulin and that their insulin resistance primarily affects the glycogen synthetic pathway. Type 2 diabetes [4, 5] and obesity [15, 16] are major cardiovascular risk factors. A common thread linking all components of the insulin resistance (metabolic) syndrome is the basic cellular/molecular cause of insulin resistance , which not only promotes inflammation and atherogenesis, but leads to and/or aggravates other components of the syndrome, which themselves are major CVD risk factors. Hypertension is a central feature of the insulin resistance syndrome. Many studies have demonstrated that hypertensive individuals are resistant to insulin, primarily involving the glycogen synthetic pathway (Fig. 1) [47, 48, 49, 50, 51], and hypertension is a well established risk factor for CVD. Type 2 diabetic and obese individuals develop dyslipidaemia characterised by hypertriacylglycerolaemia, reduced HDL-cholesterol, and small dense atherogenic LDL particles [39, 40, 52, 53], each of which is a major CVD risk factor. We and others [51, 54, 55, 56, 57] have shown that hypertriacylglycerolaemia, but not hypercholesterolaemia is associated with insulin resistance primarily involving the glycogen synthetic pathway (Fig. 1). The frequency of hypercholesterolaemia is not increased in patients with type 2 diabetes mellitus . However, if elevated, LDL-cholesterol acts synergistically with other risk factors to accelerate atherogenesis . To examine the relationship between insulin resistance and CVD, we compared normal glucose-tolerant individuals with diffuse coronary artery disease with normal glucose-tolerant participants with clean coronary arteries . Individuals with coronary artery disease manifested marked insulin resistance, primarily affecting the glycogen synthetic pathway in skeletal muscle  (Fig. 1). Studies by Reaven  and Paternostro et al. have demonstrated that non-diabetic individuals with established coronary artery disease are resistant to insulin. Using positron emission tomography, the myocardium of non-diabetic individuals with coronary artery disease  and type 2 diabetic patients without coronary artery disease  has been shown to be resistant to insulin. In summary, each component of the ‘metabolic’ syndrome is characterised by insulin resistance involving the glycogen synthetic pathway (Fig. 1). Insulin resistance is present at the stage of impaired glucose tolerance [63, 64] and even before any abnormality in glucose tolerance is observed . Thus, we prefer to refer to the metabolic and cardiovascular cluster of factors that comprise the ‘metabolic’ syndrome as the ‘insulin resistance syndrome’ [20, 21, 66]. This focuses clearly on a specific pathogenic aetiology, rather than on a diffuse cluster of factors that may or may not be related to the same underlying pathophysiology. Multiple prospective studies have demonstrated that insulin resistance predicts future CVD. In the San Antonio Heart Study , insulin resistance was quantitated by HOMA of insulin resistance (HOMA-IR) in 2,564 non-diabetic participants who were followed for 8 years. Individuals in the highest quintile of insulin resistance had an approximately 2.5-fold increased incidence of CVD (Fig. 2a). After adjustment for multiple cardiovascular risk factors, individuals in the highest quintile of insulin resistance still had a twofold increased incidence of CVD. In 3,606 non-diabetic participants followed for 6.9 years in the Botnia Study  (Fig. 2b), the metabolic syndrome was associated with a threefold increased risk of CVD. Each component of the metabolic syndrome, as well as insulin resistance (HOMA-IR) itself, was associated with a 1.5- to 2-fold increased incidence of CVD (Fig. 2b). Similar observations have been made in the Bruneck , Verona Diabetes  and Insulin Resistance Atherosclerosis studies . A strong relationship between HOMA-IR and carotid intimal media thickness has also been demonstrated , as has an association between insulin resistance and greater cardiovascular risk factor load . The analysis by D’Agostino et al. of six prospective studies further supports an independent role for insulin resistance in CVD . It found that, using the Framingham Cardiovascular Risk Engine , only 69% of the observed risk for CVD could be explained, leaving 31% unaccounted for (Fig. 3a). Similarly, in the ARIC study  (Fig. 3b), only ∼70% of the increase in carotid intimal media thickness could be accounted for by dyslipidaemia, hypertension, glucose intolerance and obesity. We hypothesise that this unexplained risk can be attributed to insulin resistance. As shown in Fig. 4a, for insulin to exert its biological effects, it must first bind to specific cell surface receptors [77, 78]. This activates ‘second messengers’, which initiate a phosphorylation–dephosphorylation cascade that stimulates glucose transport (via GLUT4), glucose phosphorylation (via hexokinase II), glycogen synthase (which controls glycogen synthesis) and both phosphofructokinase and pyruvate dehydrogenase (which regulate glycolysis and glucose oxidation) . In muscle, insulin binding to its receptor [77, 79] leads to tyrosine phosphorylation of IRS-1, which mediates insulin’s effect on glucose metabolism. In liver, IRS-2 phosphorylation mediates the actions of insulin. IRS-1 activates phosphatidylinositol (PI)-3 kinase , which catalyses 3′ phosphorylation of PI, PI-4 phosphate and PI-4,5 diphosphate, and augments glucose transport and glycogen synthase [81, 82, 83]. Inhibitors of PI-3 kinase inhibit glucose transport , hexokinase II  and glycogen synthase . Insulin signalling also plays a critical role in activating nitric oxide synthase, which regulates nitric oxide production [86, 87, 88]. Nitric oxide is a potent vasodilator and anti-atherogenic agent . Nitric oxide deficiency activates multiple pathways involved in atherogenesis [89, 90]. Thus, a defect in insulin signalling, not only impairs glucose utilisation, but causes hypertension and accelerated atherosclerosis. Insulin is a potent growth factor [20, 26, 27, 91, 92], whose growth-promoting effects are mediated via the mitogen-activated protein (MAP) kinase pathway . After the interaction between IRS-1 and SHC, extracellular regulated kinase (ERK) is activated [77, 94], translocates into the nucleus and catalyses phosphorylation of transcription factors that promote cell growth, cell proliferation and cell differentiation . Thus, this pathway plays an important role in atherogenesis. MAP kinase blockade prevents stimulation of insulin’s growth-promoting effects, but has no effect on the metabolic actions of insulin [95, 96]. Insulin resistance in the PI-3 kinase (metabolic) pathway with intact MAP kinase signalling activates multiple inflammatory pathways, including inhibitor kβ (IkB)/nuclear factor kβ (NFkB)  and c-Jun N-terminal kinase , which also cause insulin resistance. Not surprisingly, sustained physiological hyperinsulinaemia activates multiple genes involved in inflammation . Some studies [44, 78, 99] have demonstrated decreased insulin binding to monocytes and adipocytes in type 2 diabetic patients. However, in muscle and liver, insulin binding to solubilised insulin receptors is normal in obese normal glucose-tolerant and lean type 2 diabetic participants . In normal-weight and obese diabetic patients, insulin-stimulated insulin receptor tyrosine kinase activity was reduced and could not be explained by decreased insulin receptor number/binding . Normalisation of fasting plasma glucose with weight loss corrected the defect in insulin receptor tyrosine kinase , indicating that the defect is acquired. As indicated in Fig. 4b, we have shown that in skeletal muscle of lean individuals with normal glucose tolerance, physiological hyperinsulinaemia increases insulin receptor and IRS-1 tyrosine phosphorylation by 150% to 200% [94, 103]. In obese non-diabetic participants, activation of these two insulin signalling events in muscle was reduced, while in type 2 diabetic individuals insulin had no significant stimulatory effect . Association of PI-3 kinase with IRS-1/IRS-2 was greatly reduced in obese non-diabetic and type 2 diabetic participants and correlated closely with impaired muscle glycogen synthase activity and with in vivo insulin-stimulated glucose disposal . Our studies in human skeletal muscle  (Fig. 4b) were the first to demonstrate that in insulin-resistant type 2 diabetic and obese non-diabetic individuals the profound insulin resistance in the PI-3 kinase pathway contrasts with the normal stimulatory effect of insulin on the MAP kinase pathway (MAP kinase kinase 1 activity and ERK1/2 phosphorylation/activity) . Maintained insulin stimulation of the MAP kinase pathway, with persistent insulin resistance in the PI-3 kinase pathway, represents an important pathogenic mechanism for development of CVD in insulin-resistant states (see subsequent discussion). Our studies in man demonstrated that impaired IRS-1 tyrosine phosphorylation/PI-3 kinase activation in lean type 2 diabetic and obese non-diabetic participants causes a profound defect in glucose transport/phosphorylation and glycogen synthesis (Fig. 4b) [104, 105]. Because nitric oxide synthase is activated by the same PI-3 kinase pathway, nitric oxide production is impaired [106, 107], resulting in endothelial dysfunction [108, 109, 110] and accelerated atherosclerosis [110, 111, 112, 113]. This pathogenic sequence establishes the molecular basis linking insulin resistance, inflammation and accelerated atherosclerosis in people with type 2 diabetes mellitus and may help account for the missing 30% CVD risk that cannot be explained by circulating cardiovascular risk factors [74, 76] (Fig. 4b). This pathogenic sequence also explains why insulin resistance is a strong predictor of CVD [67, 68, 69, 70, 71, 72, 73]. Once the insulin signalling defect becomes established, it initiates a reverberating negative feedback cycle. Impaired glucose utilisation causes hyperglycaemia, which stimulates insulin secretion (Fig. 4b). Because the IRS-1/PI-3 kinase pathway is defective, the MAP kinase pathway is excessively stimulated since it is normally sensitive to insulin. Increased IRS-1 serine phosphorylation, induced by metabolic/inflammatory abnormalities present in the diabetic state (reviewed by Draznin ), further impairs insulin signalling through the PI-3 kinase pathway [115, 116]. In diabetic and obese patients, continued MAP kinase pathway stimulation  causes vascular smooth muscle proliferation, increased collagen formation and excessive production of growth factors/inflammatory cytokines, contributing to accelerated atherosclerosis. The same insulin signalling defects that we have demonstrated in skeletal muscle of type 2 diabetic patients have been demonstrated in arterial vascular smooth muscle cells (VSMC) in animal models of diabetes and in humans [92, 117, 118]. Draznin and colleagues [93, 114] have provided additional evidence for this ‘dual insulin signalling hypothesis’. In cultured VSMCs and endothelial cells treated with PI-3 kinase inhibitors, insulin cannot activate nitric oxide synthase to generate nitric oxide and these cells are no longer protected from the detrimental effects of vascular endothelial growth factor, platelet-derived growth factor (PDGF) and other inflammatory peptides. Insulin continues to stimulate VSMC proliferation/migration even though the PI-3 kinase pathway has been inhibited and increases prenylated Ras (rat sarcoma) and Rho (Ras related homologue), leading to augmented VSMC response to the growth-promoting effects of IGF-1, epidermal growth factor, PDGF and angiotensin II. These effects are enhanced when PI-3 kinase is inhibited [119, 120]. The sensitising effect of VSMCs to angiotensin II is of particular importance, since hyperinsulinaemia doubles the ability of angiotensin II to transactivate NF-kB , a powerful nuclear transcription factor that activates multiple inflammatory pathways involved in atherogenesis [121, 122] and causes IRS-1 serine phosphorylation, which inhibits insulin signalling . Angiotensin II also serine phosphorylates IRS-1 in aortic smooth muscle and skeletal muscle cells . This provides a pathophysiological link between insulin resistance, atherogenesis and essential hypertension. To examine whether the insulin signalling defect is genetic or acquired, we studied lean normal glucose-tolerant offspring of two diabetic parents . These offspring are severely insulin-resistant [65, 103] and at high risk of developing diabetes. Insulin-stimulated glucose disposal was markedly reduced despite increased insulin receptor tyrosine phosphorylation . Basal and insulin-stimulated IRS-1 tyrosine phosphorylation/PI-3 kinase activity were markedly reduced. From these observations five points ensue: (1) early in the natural history of type 2 diabetes insulin receptor activation is normal (Fig. 4b); (2) the rate-limiting step for insulin signalling resides at IRS-1; (3) molecular abnormalities responsible for insulin resistance are present long before onset of overt diabetes or impaired glucose tolerance; (4) insulin normally augments MAP kinase, but not PI-3 kinase, demonstrating dissociation between regulation of PI-3 kinase and MAP kinase pathways; and (5) tissues of offspring with normal glucose tolerance are being ‘incubated’ in a ‘sea’ of molecular insulin resistance and atherogenicity from an early age, explaining in part why clinically evident CVD is present in 15 to 20% of individuals at initial diagnosis  and why insulin resistance and CVD are closely linked [19, 20, 44, 67, 68, 69, 70, 71, 72]. Only thiazolidinediones simultaneously augment the PI-3 kinase (metabolic) pathway while inhibiting the MAP kinase (atherogenic) pathway [126, 127]. Thiazolidinediones also enhance nitric oxide synthase activity, increasing nitric oxide production [128, 129, 130]; they also reduce high-sensitivity C-reactive protein levels and improve multiple cardiovascular risk factors in type 2 diabetic participants . The term ‘lipotoxicity’ was coined by Unger to describe the deleterious effect of tissue fat accumulation on glucose metabolism . However, lipotoxicity has assumed added significance (see textbox: Lipotoxicity). Experimental NEFA elevation to reproduce levels in type 2 diabetes causes severe muscle/liver insulin resistance [133, 134, 135] and inhibits insulin secretion , reproducing the three basic core defects of type 2 diabetes. Elevated plasma NEFA impair glucose oxidation/glycogen synthesis  and decrease glucose transport/phosphorylation [104, 135]. Most importantly, lipid infusion to increase plasma NEFA levels in participants with normal glucose tolerance caused a dose–response inhibition of insulin receptor/IRS-1 tyrosine phosphorylation and PI-kinase activity, which correlate closely with reduced insulin-stimulated glucose disposal . Magnetic resonance spectroscopic studies have demonstrated that intramyocellular and intrahepatic fat accumulation are closely associated with organ-specific insulin resistance [138, 139, 140, 141]. Intracellular toxic metabolites of triacylglycerol and NEFA metabolism (fatty acyl CoA, diacylglycerol, ceramides) cause severe insulin resistance by impairing insulin signalling and multiple intracellular steps of glucose metabolism [133, 137, 142]. To examine the causality of this association, we treated type 2 diabetic patients with acipimox, an inhibitor of lipolysis. The decline in plasma NEFA (563 to 230 mmol/l) was associated with decreased muscle long-chain fatty acyl CoA , which correlated closely with enhanced insulin-stimulated muscle glucose uptake (Fig. 5). The deleterious effect of increased intracellular fat on insulin sensitivity is supported by the work of Kim et al. , who overexpressed lipoprotein lipase in muscle or liver in mice. In muscle this caused a marked increase in fat content, severe insulin resistance and impaired PI-3 kinase activity, without affecting hepatic insulin sensitivity. Lipoprotein lipase overexpression in liver increased hepatic fat content, induced severe hepatic insulin resistance and impaired hepatic insulin signalling, but had no effect on muscle . Long-chain fatty acyl CoAs cause IRS-1 serine phosphorylation, thereby inhibiting the PI 3 kinase pathway [145, 146]. In animals  and humans , plasma NEFA elevation by lipid infusion also increased intramyocellular diacylglycerol, a potent activator of protein kinase C (PKC) isoforms, which inhibit insulin signalling through serine phosphorylation of IRS-1 . Muscle  and plasma  ceramide levels are also increased in obese and type 2 diabetic individuals, correlating closely with severity of insulin resistance. In summary, much evidence supports the notion that increased plasma NEFA/intramyocellular levels of toxic lipid metabolites (long-chain fatty acyl CoAs, diacylglycerol, ceramides) play a role in the pathogenesis of muscle/liver insulin resistance. Type 2 diabetes and obesity are characterised by low-grade, chronic inflammation [152, 153, 154], which could contribute to accelerated atherosclerosis. Increased activity of IkB/NFkB provides a molecular mechanism responsible for inflammation and insulin resistance in type 2 diabetes mellitus [91, 148, 152, 155]. Under basal conditions, NFkB is associated with IkB in the cytoplasm (Fig. 6). Upon activation by inflammatory factors, including fatty acyl CoAs, IkB kinase phosphorylates IkB, causing IkB polyubiquitination and degradation. The free NFkB translocates to the nucleus, where it binds to target genes, stimulating inflammatory mediators (TNFα, IL-1B, IL-6, PKC) involved in atherogenesis [152, 156, 157]. TNFα, IL-6 and PKC, as well as IK kinase, cause serine phosphorylation of IRS-1, inhibiting insulin signalling and causing insulin resistance [123, 158]. Skeletal muscle IkB content is decreased in type 2 diabetic patients , indicative of increased NFkB activity. We have confirmed this by demonstrating increased NF-kB p50–p65 DNA binding activity in type 2 diabetic and obese individuals (P Tantiwong, K Shammugasumdaran, A Monroy, S Ghosh, E Cersosimo, A Sriwijitkamol, RA DeFronzo, S Mohan, N Musi, unpublished results). Reduced IkB and increased NFkB p50–p65 binding activity were strongly correlated with reduced insulin sensitivity. Multiple stimuli , including lipids, activate IkB kinase/NFkB, causing insulin resistance in cultured myocytes  and muscle from rodents [155, 161] and humans . In human myocytes, palmitate enhances NFkB activity and increases IL6 mRNA, a downstream gene regulated by NFkB. Transfection of myocytes with an adenovirus-IkB super repressor mutant blocked the augmentation of NFkB activity and of IL6 mRNA expression by palmitate . Circulating NEFA also cause inflammation and insulin resistance by directly activating plasma membrane receptors, such as toll-like receptor 4  (Fig. 7). In muscle of obese and type 2 diabetic individuals, toll-like receptor 4 mRNA/protein content is increased and correlates closely with HOMA-IR  and IkB/NFkB activation, providing another pathway via which NEFA incite inflammation and promote atherogenesis. NEFA also stimulate formation of collagen, an integral component of the atherosclerotic plaque [163, 164]. Physiological NEFA elevation in participants with normal glucose tolerance increases mRNA expression of collagen, fibronectin and lumican, as well as connective tissue growth factor , a member of the CCN gene family, which mediates fibrotic responses . Increased connective tissue growth factor levels are a characteristic finding in complicated atherosclerotic plaques and induce mononuclear cell chemotaxis . Plasma NEFA exert profound effects on endothelial function. Insulin-stimulated blood flow is mediated via nitric oxide  and is impaired in obese and type 2 diabetic individuals [108, 165]. Experimental plasma NEFA elevation in participants with normal glucose tolerance reduced endothelium-dependent blood flow, without altering endothelium-independent blood flow . Endothelial dysfunction is associated with accelerated atherosclerosis and insulin resistance [110, 111], providing another mechanism via which NEFA promote CVD in type 2 diabetes mellitus. ‘Adiposopathy’ is another form of lipotoxicity . Fat cells produce adipocytokines, which travel to distant sites (muscle, liver, arterial tissue) where they exert deleterious effects on metabolism and vascular function. Adipose tissue of obese and type 2 diabetic individuals is infiltrated by mononuclear cells and is in a state of chronic inflammation . The adipocytes and infiltrated macrophages secrete proinflammatory/prothrombotic cytokines (TNFα, resistin, IL-6, plasminogen activator inhibitor-1, angiotensinogen) that promote atherogenesis and cause insulin resistance (reviewed by Bays et al. ). Adipocytes also under-produce adiponectin, a potent insulin-sensitising, anti-atherogenic cytokine . Accumulation of fat within the intraabdominal cavity, i.e. visceral fat (Fig. 8), is associated with insulin resistance and CVD [131, 168, 169]. Although the mechanism(s) for this association remain(s) unclear, visceral obesity is part of the insulin resistance (metabolic) syndrome [38, 39, 40]; however, the individual components of the insulin resistance syndrome, not the increase in visceral fat, may account for the increased incidence of CVD. What therapeutic interventions reverse lipotoxicity? Tissue fat overload is explained by: (1) excessive energy intake; (2) increased lipolysis in insulin-resistant adipocytes, leading to increased plasma NEFA and enhanced influx into muscle/liver; and (3) decreased fat oxidation. Weight loss (energy-intake restriction) has proven effective in reducing total body fat content . Glucagon-like peptide-1 analogues are potent appetite suppressants and effectively promote weight loss . Thiazolidinediones exert the following unique actions that ameliorate lipotoxicity (Textbox 3): (1) decrease plasma NEFA by inhibition of lipolysis; (2) reduction of muscle long-chain fatty acyl CoA levels; (3) redistribution of fat within the body; and (4) amelioration of adiposopathy. Thiazolidinediones are potent insulin sensitisers in muscle and liver [126, 127, 140, 141, 172, 173] and improve sensitivity to the antilipolytic effect of insulin, decreasing basal NEFA turnover/plasma NEFA . Thiazolidinediones also improve hepatic insulin sensitivity, leading to decreased basal hepatic glucose production and enhanced hepatic glucose production suppression by insulin [140, 172, 173, 174]. Reduced plasma NEFA levels correlate closely with improved insulin-stimulated muscle glucose disposal and decreased hepatic glucose production. In type 2 diabetic patients, impaired insulin-stimulated IRS-1 tyrosine phosphorylation and PI 3 kinase activity  (Fig. 9) are improved by rosiglitazone , with enhanced insulin signalling correlating closely with reduced plasma NEFA. Similarly, pioglitazone increases insulin-stimulated glucose disposal by 35% in association with reduced fasting NEFA, muscle fat content and fatty acyl CoAs [127, 173] (Fig. 5). These results provide strong evidence that thiazolidinediones improve muscle insulin sensitivity via reversal of lipotoxicity. Impaired ATP synthesis and mitochondrial dysfunction have been demonstrated in insulin-resistant states including ageing, offspring of diabetic parents, obesity and type 2 diabetes mellitus [175, 176, 177, 178, 179]. Using 31P nuclear magnetic resonance spectroscopy, Petersen et al. have shown that decreased ATP synthesis is associated with increased intramyocellular fat. In isolated mitochondria from obese and type 2 diabetic individuals, we have demonstrated that ATP synthesis is reduced [179, 180] and correlates closely with decreased insulin-stimulated glucose disposal and increased fasting plasma NEFA. To examine whether fatty acid metabolites directly inhibit mitochondrial function, we incubated mitochondria from participants with normal glucose tolerance with palmitoyl carnitine . At concentrations <2 μmol/l, palmitoyl carnitine stimulated ATP synthesis, while at concentrations >2 μmol/l it progressively decreased ATP synthesis and inner mitochondrial membrane potential, which provides the voltage gradient driving electron transport. Type 2 diabetic individuals and insulin-resistant offspring with normal glucose tolerance have reduced expression of multiple nuclear genes that encode enzymes involved in oxidative metabolism, including peroxisome proliferator-activated receptor (PPAR)γ coactivator (PGC-1) , the master regulator of mitochondrial biogenesis . A twofold increase of plasma NEFA in participants with normal glucose tolerance reduced muscle expression of PGC-1 and multiple mitochondrial genes to levels observed in diabetic individuals , providing evidence of ‘mitochondrial lipotoxicity’. Treatment of type 2 diabetic patients with pioglitazone upregulated PGC-1α (also known as PPARGC1A) and PGC-1β (also known as PPARGC1b) mRNA expression in association with increased expression of pyruvate dehydrogenase alpha 1 (PHDA1) and other mitochondrial oxidative phosphorylation genes  (Fig. 10), ameliorating ‘mitochondrial lipotoxicity’. Pioglitazone also ameliorates lipotoxicity via effects mediated through adiponectin and adiponectin receptor (Fig. 11). Hypoadiponectinaemia is characteristic of type 2 diabetes. Thiazolidinediones increase plasma adiponectin levels to or above those in non-diabetic patients [131, 173]. Adiponectin is a potent insulin sensitiser in muscle and liver  and exerts multiple anti-atherogenic effects [185, 186]. In type 2 diabetic patients and insulin-resistant offspring with normal glucose tolerance, adiponectin receptor 1 and 2 expression is reduced . Pioglitazone treatment increases expression of muscle adiponectin receptors 1 and 2 and AMP kinase . Similar effects have been demonstrated in cultured human myocytes and do not require PPARγ stimulation . Pioglitazone also upregulated acetyl-CoA carboxylase and carnitine palmitoyl transferase expression/activity, leading to the postulate (Fig. 11) that pioglitazone increases plasma adiponectin levels and expression of adiponectin receptors 1 and 2, stimulating AMP kinase and acetyl-CoA carboxylase activity, with resultant inhibition of malonyl CoA. This augments carnitine palmityol transferase I activity and enhances NEFA flux into mitochondria, where they undergo beta oxidation. The result is a decrease in intramyocellular fatty acyl CoA levels, leading to improved muscle insulin signalling/insulin sensitivity. Thiazolidinediones redistribute body fat by reducing visceral and increasing subcutaneous fat [189, 190] (Fig. 8). They also reduce muscle fatty acyl CoA, leading to improved insulin sensitivity and glycaemic control [126, 127, 140, 141, 172, 173, 176]. Thiazolidinediones also reduce liver fat and are effective in treating non-alcoholic steatohepatitis [139, 191]. In a randomised, placebo controlled study of 55 participants with type 2 diabetes/impaired glucose tolerance and biopsy-proven non-alcoholic steatohepatitis, pioglitazone reduced liver fat by 54% (p < 0.001), normalised alanine aminotransferase and aspartate aminotransferase, and reduced hepatic inflammation, ballooning necrosis and fibrosis . Thiazolidinediones preserve beta cell function in type 2 diabetic patients . Eight double-blind, placebo/active comparator-controlled studies demonstrate that thiazolidinediones have a durable effect in reducing HbA1c (reviewed by DeFronzo ) because of a beta cell protective effect. Five studies in participants with impaired glucose tolerance document that thiazolidinediones markedly reduced conversion to type 2 diabetes, primarily by improving beta cell function (reviewed by DeFronzo ). Using the gold standard insulin secretion/insulin resistance (disposition) index, both pioglitazone and rosiglitazone have been shown to improve beta cell function in drug naive and sulfonylurea-treated type 2 diabetic patients . Thiazolidinediones augment beta cell function by multiple mechanisms, including direct effects (increased GLUT2, glucokinase, Pdx) exerted through PPARγ , and by reducing intracellular fatty acyl CoA levels [194, 195, 196]. Myocardial lipid content is increased in type 2 diabetic individuals [197, 198] and contributes to diastolic dysfunction [198, 199]. The myocardium in type 2 diabetes is markedly insulin-resistant [61, 198]. The insulin resistance cannot be explained by coronary artery disease  and correlates with increased myocardial fat [198, 200]. Rosiglitazone similarly improved myocardial and skeletal muscle insulin resistance . Although myocardial fat content was not measured in these studies, it is reasonable to hypothesise that thiazolidinediones exert their myocardial insulin sensitising effect, in part by reducing myocardial fat content. Coronary and carotid arterial disease represent the major cause of mortality in patients with type 2 diabetes . Elevated plasma LDL-cholesterol and triacylglycerol, and reduced HDL-cholesterol all contribute to accelerated atherogenesis in type 2 diabetes. Quantitative lipid analysis of atherosclerotic plaques reveals large amounts of NEFA and fatty acid metabolites [35, 36, 37], which can stimulate inflammatory pathways involved in atherogenesis. Pioglitazone reduces plasma triacylglycerol, increases HDL-cholesterol, converts small dense LDL particles to larger more buoyant ones and decreases apolipoprotein B-100 without altering plasma LDL-cholesterol [201, 202]. Thiazolidinediones also markedly reduce plasma NEFA [127, 139, 172], which would be expected to reduce fatty acyl CoAs and other toxic fatty acid metabolites within arterial smooth muscle cells, thus inhibiting atherogenesis. Thiazolidinediones also inhibit release of proinflammatory, prothrombotic, atherogenic adipocytokines from fat tissue [139, 141, 172, 203] and redistribute fat from visceral (atherosclerotic equivalent) to subcutaneous depots [189, 190]. Thus, thiazolidinediones ameliorate all components of the ‘lipotoxicity syndrome’. Therefore, one could expect thiazolidinediones to reduce cardiovascular events in type 2 diabetes. The Prospective Pioglitazone Clinical Trial in Macrovascular Events  examined the effect of pioglitazone on cardiovascular outcomes in type 2 diabetes patients with a previous cardiovascular event. Although the primary composite endpoint did not reach statistical significance, a beneficial trend (10% decrease) was observed; the second principal endpoint (time to death, myocardial infarction, stroke) was significantly reduced. Analysis of all double-blind placebo-controlled pioglitazone trials in the USA demonstrated a significant reduction in cardiovascular events . Consistent with these trials, pioglitazone decreased carotid intima medial thickness  and coronary atherosclerotic plaque volume . Thiazolidinedione treatment is associated with modest weight gain (1–3 kg) that occurs within the first 12 months of treatment. Paradoxically, the greater the weight gain, the greater the reduction in HbA1c and the greater the improvements in insulin sensitivity and beta cell function [173, 189, 192]. This paradox is explained as follows. Thiazolidinediones mobilise fat from muscle, liver and beta cells leading to improved insulin sensitivity and beta cell function. PPARγ receptors are abundant in hypothalamic appetite regulation centres . Thus, thiazolidinediones simultaneously evoke two effects: (1) PPARγ activation in muscle/liver/adipocytes/beta cells; and (2) stimulation of appetite. The former improves glucose homeostasis, while the latter promotes weight gain. Consequently, increased body weight is a strong predictor of improved glycaemic control (HbA1c) in type 2 diabetes mellitus . Insulin resistance in the PI-3 kinase pathway with normal insulin sensitivity in the MAP kinase pathway plays an important role in accelerated atherogenesis in patients with type 2 diabetes mellitus. Lipotoxicity is a major cause of insulin resistance and impaired beta cell function in type 2 diabetes mellitus and plays a central role in the accelerated CVD. Interventions that mobilise fat out of tissues (restriction of energy intake, thiazolidinediones, glucagon-like peptide-1 analogues) are likely to produce a durable reduction in glycaemia and reduce atherosclerotic cardiovascular events. R. A. DeFronzo is a speaker for Amylin-Lilly and Takeda, has received grants from Amylin, Lilly, Takeda and Bristol Myers Squibb, and is an Advisory Board member and/or consultant for Amylin, Takeda, Boehringer-Ingelheim, ISIS, Novartis and Roche.